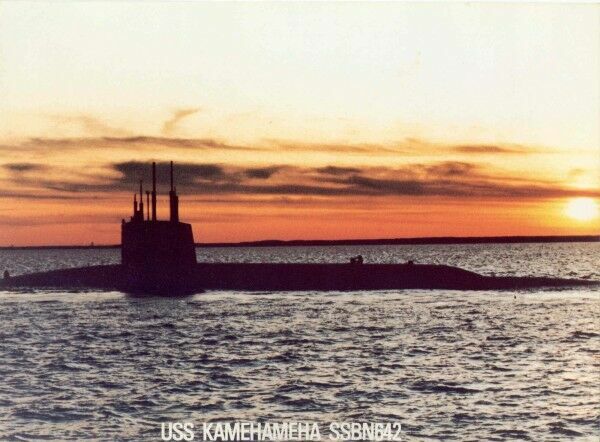 In the 1980's, a unique series of events took place that would ultimately help the Kamehameha to become the last of the "41 for Freedom" in active service. In 1981, the Kamehameha entered Portsmouth Naval Shipyard for a non-refueling overhaul. 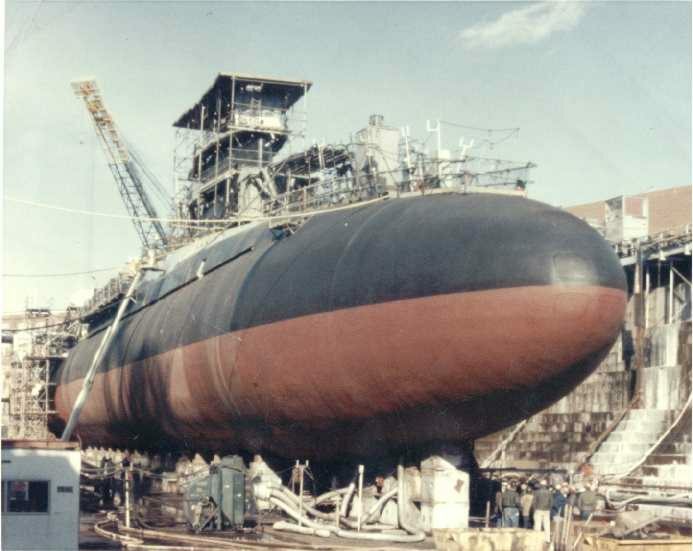 In 1983, the Kam left the shipyard in great overall condition, but with over half of the reactor core fuel life already expended. 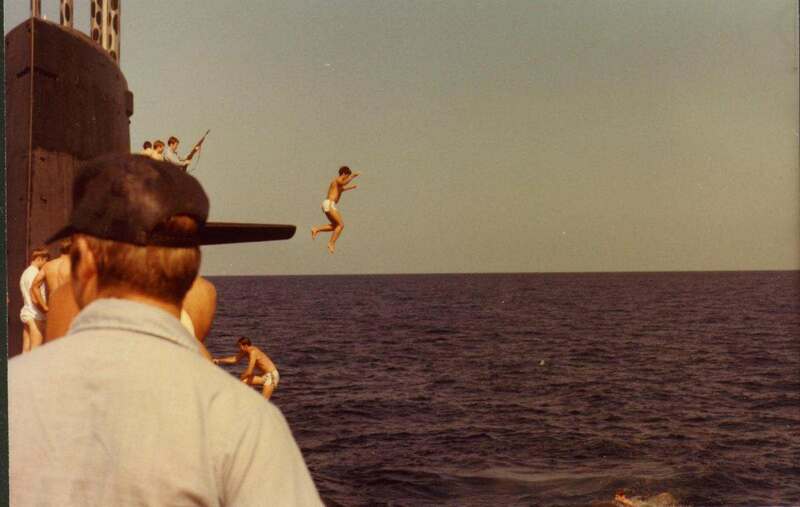 In the spring of 1983, the Gold crew partially submerged the ship with the bridge hatch open during operations off of Charleston SC. Actually, I know it wasn't that simple. Click here to find out what really happened. 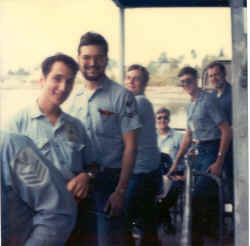 In any case, for a time after the incident, the Gold crew was known as the "wet crew" and the Blue crew was known as the "dry crew." 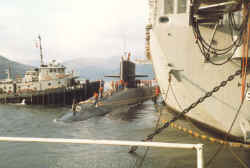 Also, as result of this incident, the Kam spent another three months at the the weapons station in Charleston for repairs. The Kamehameha was transferred to Squadron 14, Holy Loch Scotland in September of 1983. She would operate out of Holy Loch from 1983 to late 1986. The Blue crew performed Patrol 50 in the fall of 1983. By this time, Rota and Guam had already been closed down. 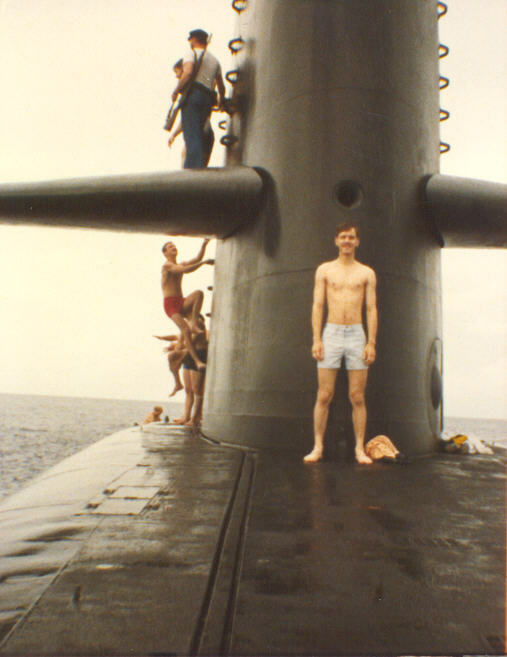 Squadron 14 became home to the mostly "older" boomers that had not been converted to the Trident C4 missile. By 1985, the Kamehameha was running low on fuel. Some measures were put in place to conserve fuel, such as "in-port readiness periods (IRPs) but the Kam spent a significant amount of time at-sea covering packages for other boats who had problems of one sort or another. 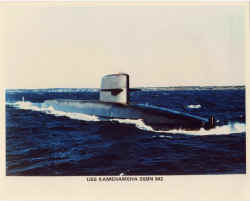 During this period, the Kamehameha was awarded two Battle "E"s, a Meritorious Unit Commendation (MUC), the red Engineering "E", the blue Supply "E" and a Golden Anchor or two as I recall. I think we won every award there was. 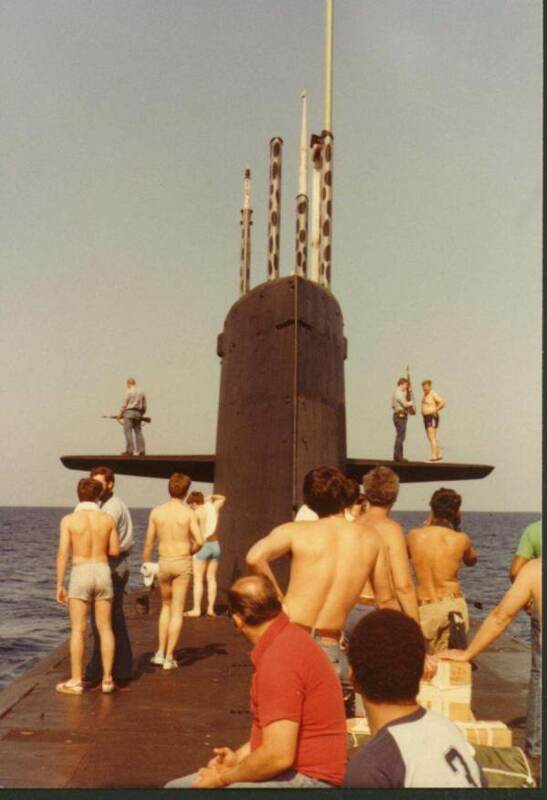 We were definitely the hottest boat in SUBRON 14. 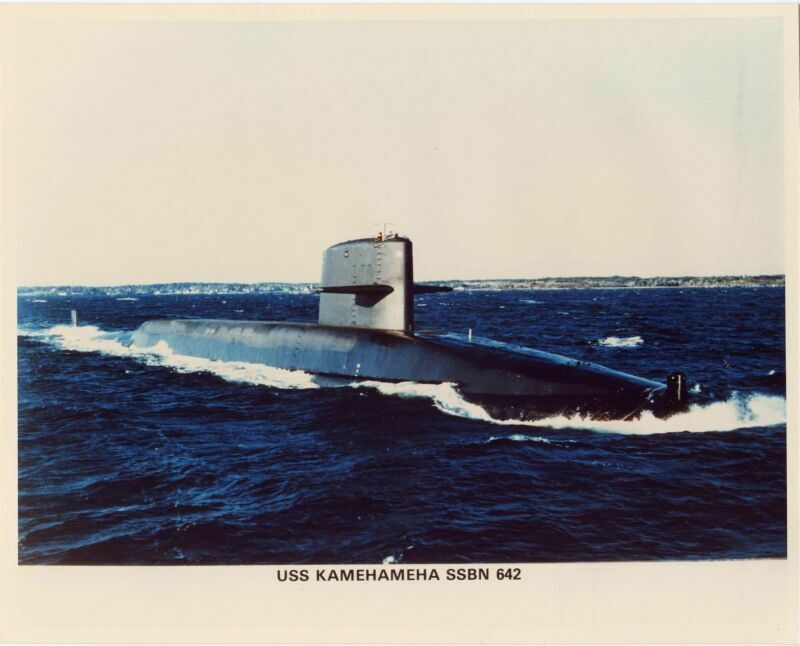 For a time, there was talk of decommissioning the Kamehameha instead of refueling. 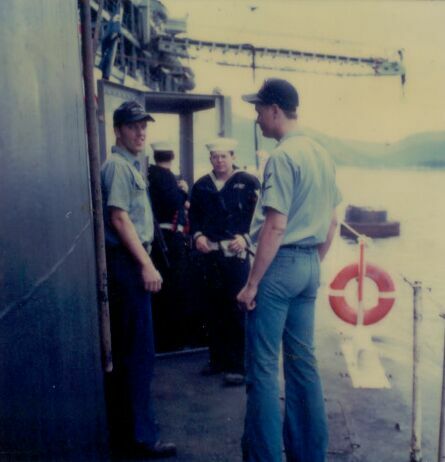 However, after completing Patrol 59, the ship underwent a long refueling overhaul at Portsmouth Naval Shipyard from November 1986 to December 1989. 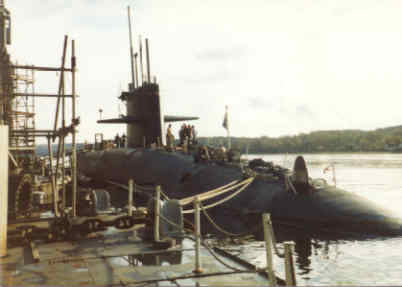 Thus, the Kam would spend nearly half of the 1980's in overhaul. As a result, she would finish the 1980's in excellent overall condition with a brand new reactor core. 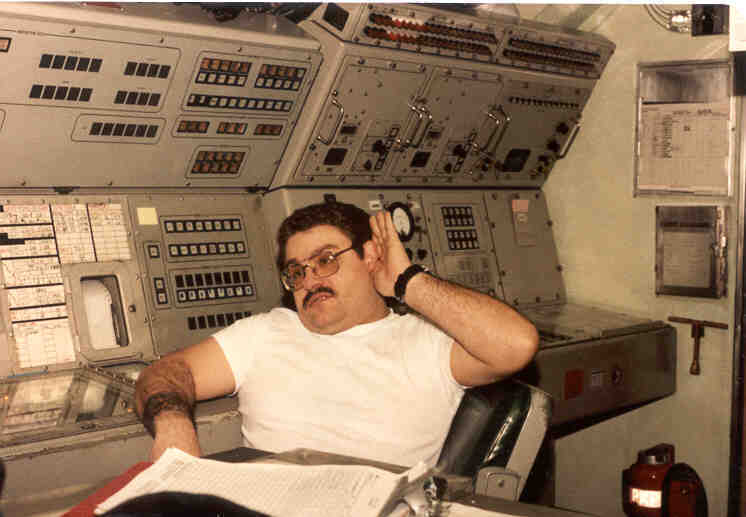 This picture was taken in the large drydock in Portsmouth Naval Shipyard around 1981. From Garry "MOLE" Miklinski. From J.R. Biggs: A shot on the barge in the yards. 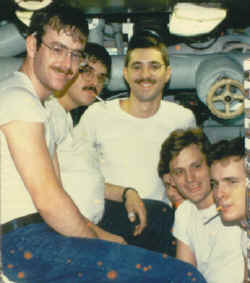 It is from left to right: Julian Paul Metzger (Raul), Ron Olmstaed (Olmey), EM2 Hiott (or Hoyt), J. R. Biggs, Bob West (Armeggedon Bob), and Allen D. Powers. 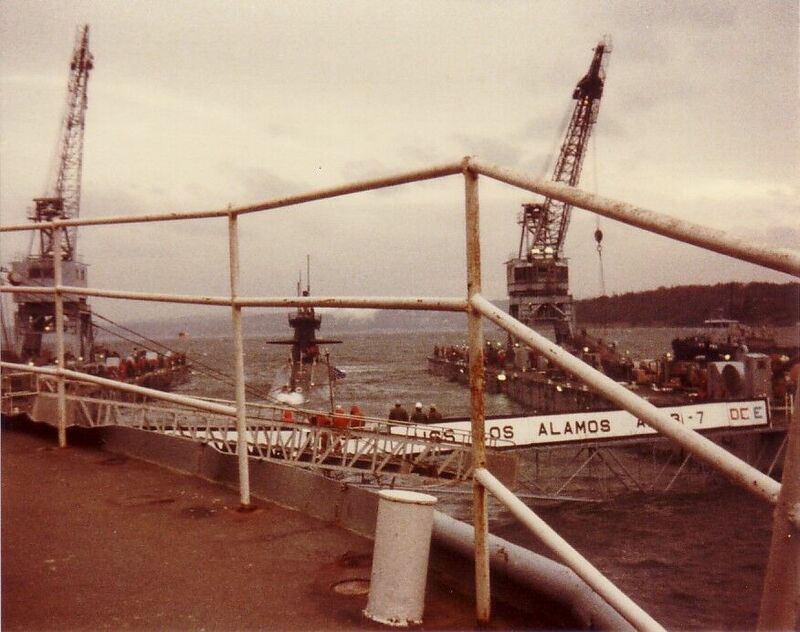 According to Bill Jones, this picture was taken in 1982 when leaving Portsmouth Naval Shipyard one cold morning. 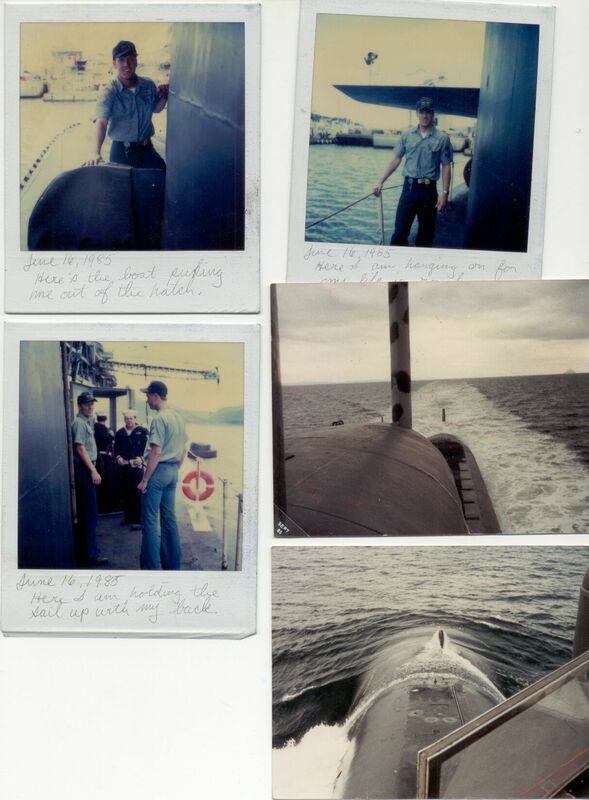 The photographer was RM2(SS) Tommy Miller. Picture donated by Pat "Doc" Delly. A nice picture donated by Charlie Monks. Taken some time in the early 1980's. The next series of 3 pictures were donated by Dave Sollars. Dave says they were "taken during sound trials (spring/summer of 83) after the Kam was in the yards in Portsmouth NH. In these shots there are a lot of civilians (contractors)"
Dave says "the guy taking the dive's name is Mike 'Josh' Ramsey. He was an EM." A lot of these guys look familiar. Too bad they are facing away from the camera. 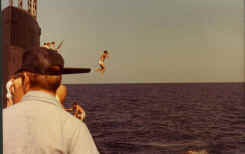 Another swim call picture, this one is yours truly, Greg Pancerev. Joel Craft took the photo with my camera. This swim call happened in the Bahamas off of Andros Island. I believe it was July of 1983. 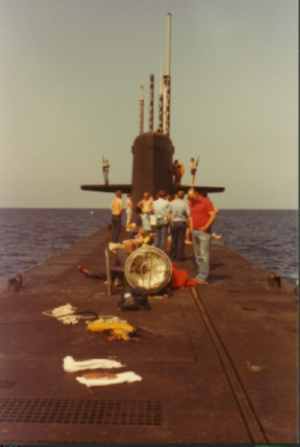 We had just failed a Mark 48 cert because of dud practice torpedoes. 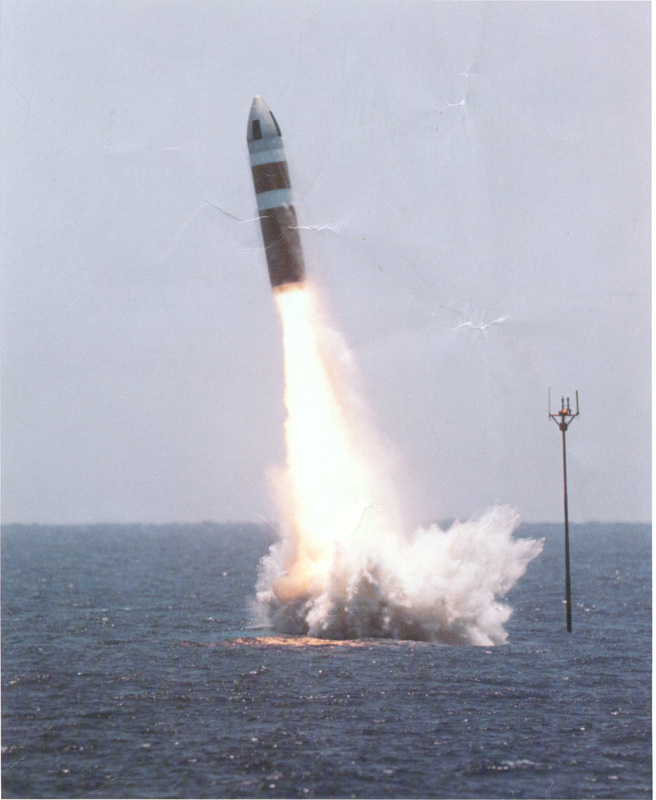 So, they cancelled our liberty call in St Thomas so we could re-do the Mk 48 cert. This swim call was our consolation prize. Not quite St. Thomas, but such is the life of the submariner. I was just a little skinnier then than I am now. 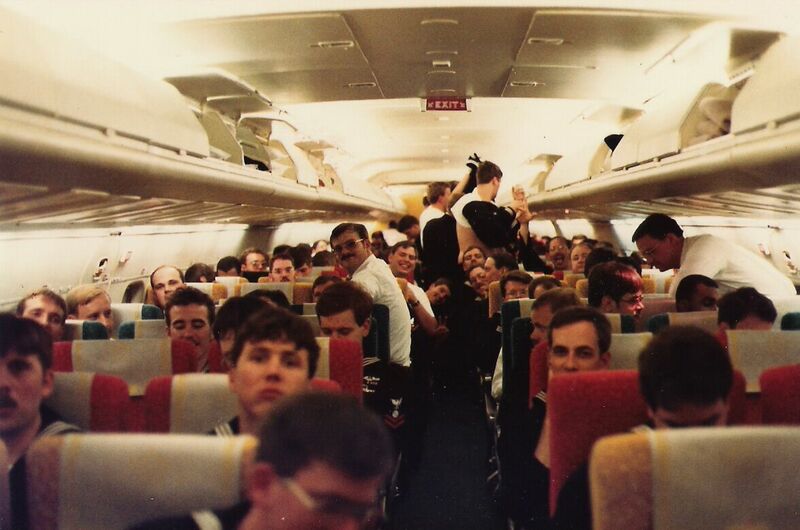 Flyaway - the blue crew on the flight to Holy Loch, probably fall of 1984. All of these flights were on old used 707s. Note that the seats are different colors. The charter flights were run by airlines such as Arrow, Evergreen, American Trans Air, etc. Turns out that at least one of these carriers was a front company for the CIA. 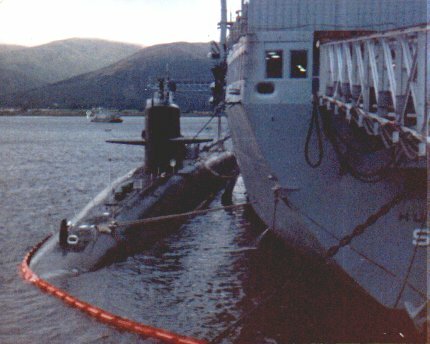 The Kamehameha in Holy Loch Scotland about 1985. 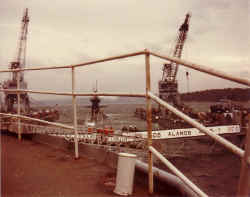 Moored to the floating drydock (USS Los Alamos). Holy Loch could be a very beautiful place on those rare days when the weather wasn't totally awful. This photo comes from Bill LaRusch. 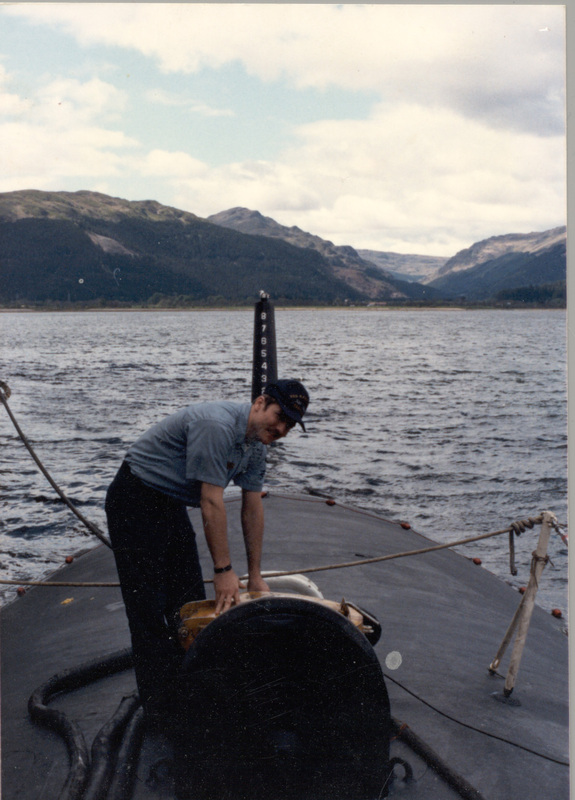 He believes it was taken in 1985 in Holy Loch. Dave Andersen is the tall SKSN standing to the right of Bill. See more pictures from Bill LaRusch. One of my favorite photos of the Kamehameha. The boat is being moved alongside the tender USS Hunley, in Holy Loch. Probably 1986. I remember sometimes when a berth shift could be an all-day evolution, at least for the nucs. From Craig Blichfeld; a picture of the boat manuevering into the drydock. 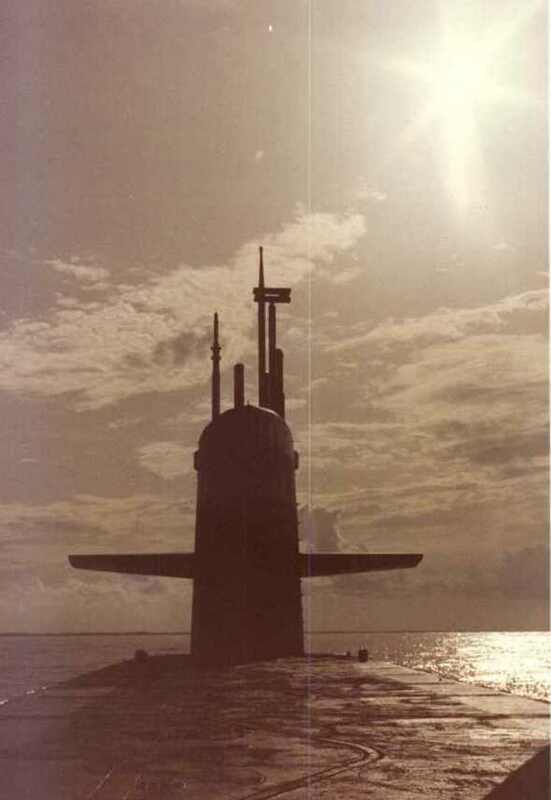 Another picture from the side of the Hunley. This one is from Ken Pugh. 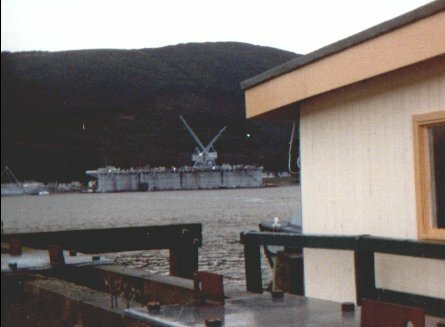 In the upper right corner, you can see the brow or gangway leading from the tender to the barge where we would catch the liberty launch. I also remember seeing this brow fall in to the water during a sudden storm that blew into the loch. This, of course, secured all liberty launches for the evening, effectively preventing me from having my first beer after a 67 day patrol. This is a picture of the floating drydock, Los Alamos in Holy Loch. The picture is taken from the pier. Does anyone remember sleeping on the pier after missing that last liberty launch of the night? If you got there early enough, you could get a bench to sleep on. Otherwise, you were sleeping on the floor in that little shack with a bunch of drunks. Photo from Ken Pugh. Here are some Gold Crew Nucs from the mid 1980s. Wanted: More photos and stories from the 1980s.